Chem-Dry, your trusted professional carpet cleaner and provider of other in-home services that help you maintain a clean and healthy home, now offers a granite countertop renewal treatment that will allow you to fall in love with your granite countertops all over again. We recently commissioned an independent laboratory to study the effectiveness of our Granite Renewal Process in multiple homes. 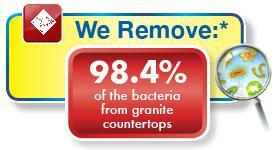 This study found that our Granite Countertop Renewal process, in conjunction with a sanitizer, removes an average of 98.4%of bacteria from granite countertops. Think of Chem-Dry when you want to refresh and revitalize your granite countertops for a cleaner surface, brighter shine and a healthier home. Granite countertops are an investment and a beautiful accent to any home, whether it’s in the kitchen, bathroom, family room or even outdoors. While it’s important to keep it clean, that can be a challenge. 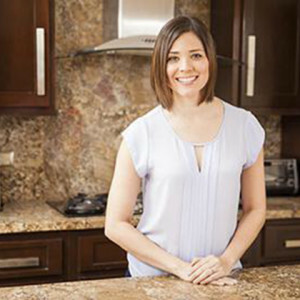 That’s why it’s good to know you can trust your friendly, local Chem-Dry operator to do the hard work for you – providing a deep granite cleaning and renewal and leaving you and your family with revitalized granite counters and a healthier home.